Some family and friends got together a few weeks ago to visit an aunt who passed away, we rode altogether to make our way to Malabon. My aunt J is my dad’s first cousin and she would always be bringing us pancit, lumpiang ubod or sapin sapin whenever there is a reunion. We got stuck in rush hour traffic en route to the wake, and I was amused to listen to stories of where they would go to eat and quickly the conversation turned into this mission to try and buy as much of the food they missed from Malabon. I haven’t been to this area in a long time, so it was nice to drive around and see some old houses and shops that have been around for generations. 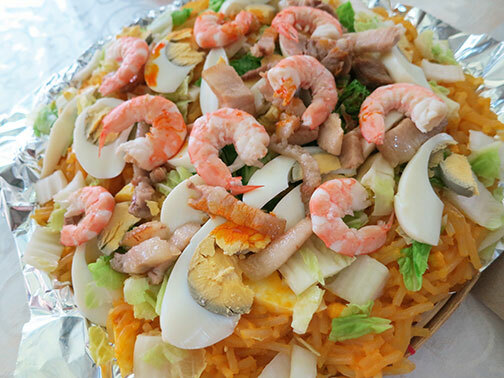 Pancit Malabon became a hot topic in the car, reminiscing Rosy’s Pancit Malabon and how we miss it so much (we discovered a couple of years ago that the family decided to close its doors). A family friend tipped us that a former employee of Rosy’s is now working at a new place called Belly’s, which opened its first branch in Tagaytay, and now in Malabon. We decided to go and have lunch in the area before we all head back home. Belly’s is an old house converted into a open grill place, we were told that it’s a popular spot for drinks and bar chow at night. I suggest nighttime would be the best time to visit since we went on a very hot day and we were sweating buckets. The restaurant staff were nice enough to bring out more fans to make us comfortable but even the air was very warm. 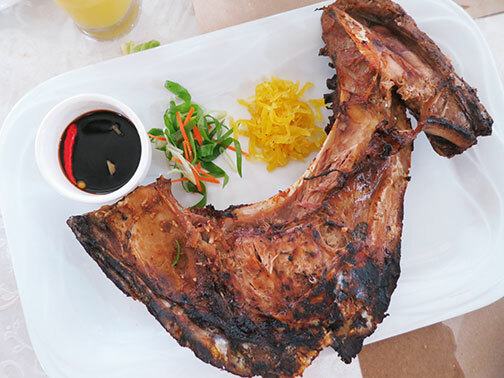 We ordered quite a lot but the ones that stood out from Belly’s is the grilled tuna jaw and crispy pata. The tuna was cooked well, its juices kept intact while the pata had a good crunchy exterior with lip smacking collagen. Again, the meat inside stayed soft and we enjoyed both dishes. We had very high hopes for the pancit, however it didn’t quite live up to our expectations. The noodles were a little too soft, and the flavor of the sauce was a little too subtle. I guess we were expecting Rosy’s version. I forgot to mention that in the middle of this eating spree, we managed to call up another restaurant called Red Palmas Food Garden to order their specialty, Baked Bangus. Bangus is abundant in Malabon but this dish is unique. 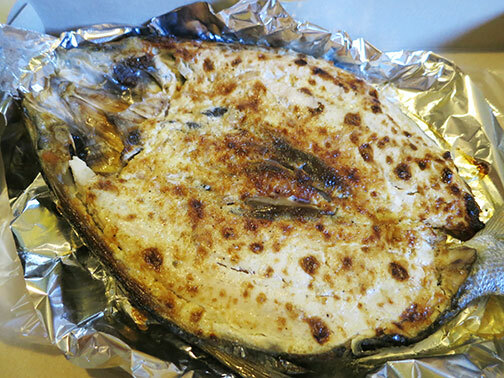 A whole bangus deboned and baked to perfection, it appears to be lightly topped with a mayonaise/cheese topping to prevent the fish from drying out when baked. We ordered around 10 of these to bring home and Red Palmas only bakes the fish as you order. It takes 30 minutes to bake but since we ordered a lot, we had to have it picked up after an hour. We brought our bangus home for dinner and easily devoured the bangus in one go. 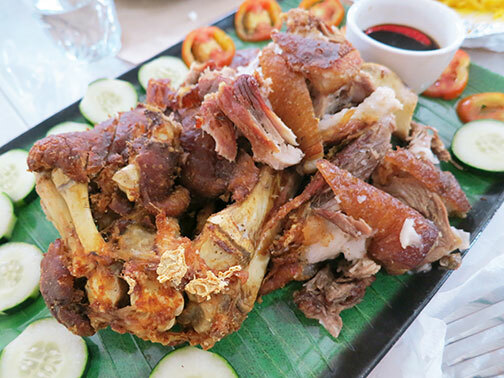 Despite the circumstances that brought us to Malabon that day, it was a joy to witness my dad and his relatives come together then recount fond memories and the food that came with it.